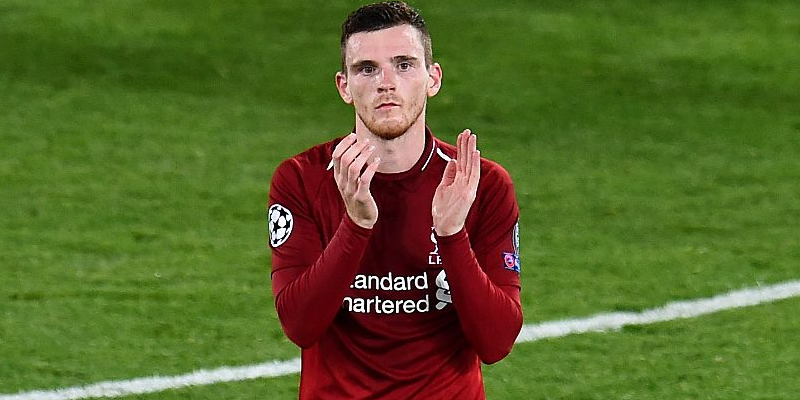 Scotland captain Andy Robertson became the latest Liverpool player to sign a new long- term contract on Thursday , with the left - back agreeing a deal until 2024 . Signed from Hull City in July 2017 , Robertson has become a fundamental part of the Liverpool side that reached last season ’ s Champions League final and currently sits four points clear at the top of the Premier League . “ As soon as the club came to me , it was a no - brainer for me – - I want to stay here , so as soon as they put an offer on the table it was signed as quickly as that , ” Robertson told Liverpoolfc . com . Robertson follows the likes of Roberto Firmino , Mohamed Salah , Sadio Mane and Joe Gomez in signing new contracts in the past year to remain at Anfield . The 24 - year - old has played a big part in a vast improvement in Liverpool ’ s defensive record that has been the catalyst for Jurgen Klopp’ s men to seize an advantage over Manchester City in the title race . Liverpool haven ’ t won the league for 29 years and Robertson is aware of the pressure the Reds are under to deliver either the Premier League or the Champions League this season . “ This club demands trophies and too long has probably passed without trophies , ” he added . “ So I hope to help bring another couple of trophies to this club and help push in that direction because the fans demand it and the club demands it, so that ’ s what we aim to give.